The well-named Great Dismal Swamp of Virginia and North Carolina is about 200 square miles of mud, bugs, bears, snakes, thorns, and quicksand. But to escaped slaves, from the 1660s through the mid-1800s, it must have seemed like heaven compared to the horrors of slavery. 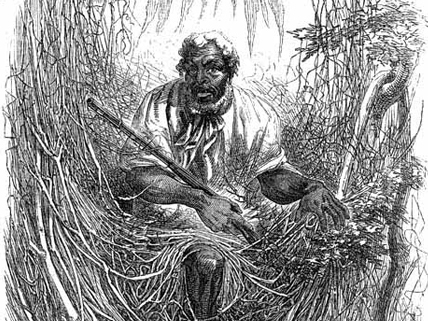 These fugitives, called maroons, farmed the swamp’s higher, drier areas, creating communities amid the swamp’s miseries for a chance to live in freedom. Now archaeologists are showing how easy-to-miss evidence can reveal new information about this chapter in slavery’s ugly history. No majestic ruins of ancient cities rise from the swamp undergrowth. Instead, the signs of habitation are subtle. For example, differences in soils indicate where cabin post holes once stood. In addition, the artifacts are small—flakes of stone, pieces of broken clay pipes, an iron nail. The leavings are meager because the maroons had escaped with very few possessions and could not risk recapture by emerging from the swamp to find supplies. Some items indicate that the maroons reused tools left by Native Americans. Others show that the maroons found new uses for even the most insignificant scraps. The Great Dismal Swamp was one of several marshy areas to harbor runaway slaves. Similar communities developed in the swamps of Louisiana, Alabama, Florida, Georgia, and South Carolina. So far, these sites have received little attention. The existence of these communities demonstrates, however, that resistance to slavery was widespread. It also shows that some slaves—just how many we may never know—escaped their oppressors without relying on white people or the Underground Railroad. Examine details of the archaeologists’ work in the Great Dismal Swamp. Explore this overview of maroon societies from the National Park Service. Read a description of a new exhibit about the Great Dismal Swamp. View a painting by American artist Thomas Moran of slaves being hunted in the swamp. This article is very interesting. The maroons were very resourceful. this is very interesting to me!!!!!!!!!!!!!!!!!!!!!!!!!!!!!!!!!!!!!!!!!!!!!!! Way to use the internet to help people solve prbolmes!